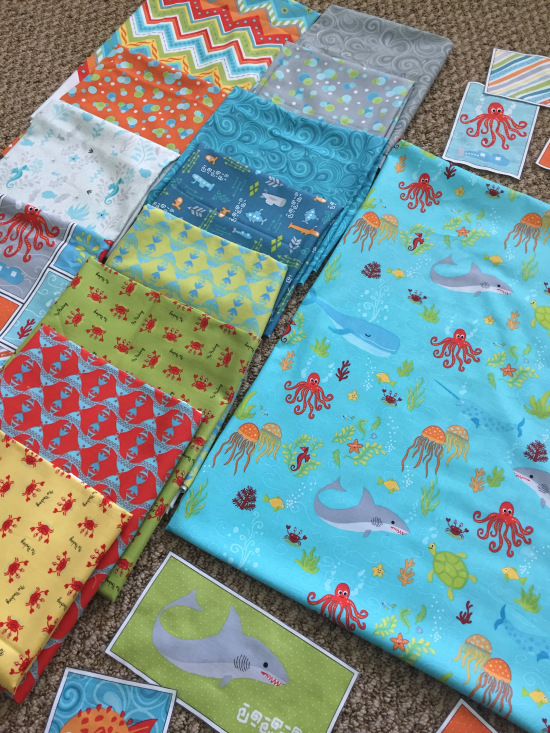 Henry Glass Fabrics: Designer Spotlight: Heather Mulder Peterson, author, pattern designer, fabric designer and mother. Designer Spotlight: Heather Mulder Peterson, author, pattern designer, fabric designer and mother. 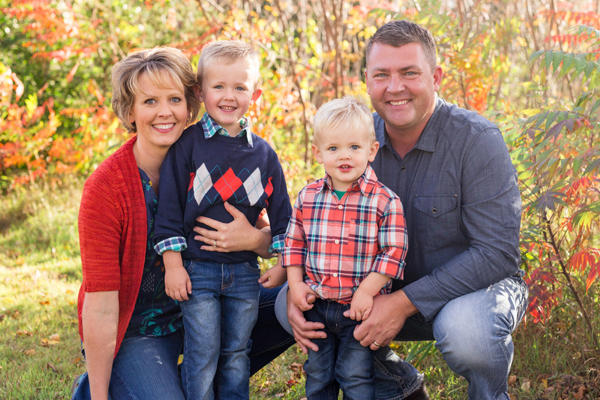 In the rural area of Willmar, Minnesota is a busy mother, who is also a designer, author, entrepreneur, and wife. Meet Heather Mulder Peterson, who is many things, but primarily she is mother to two boys, ages 2 and 4, who are in and of themselves a handful. Part angels and part mischief-makers, these two hold court for Heather’s attention, though on the day we got to have a conversation, they were at pre-school for part of the day, so mom could focus on work. And work she does! Heather is just putting the finishing touches on her 30th book so that she can launch it at International Quilt Market in St. Louis next month. 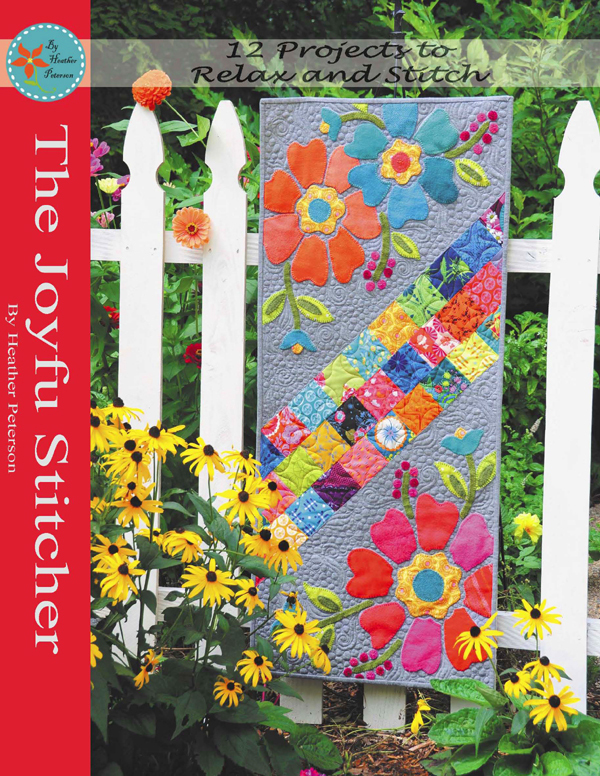 Cover of her new book, "The Joyful Stitcher"
Thirty books! Heather says she just picks a topic that she is interested in, such as appliques, large scale fabrics, projects for pre-cuts, table runners, kid’s projects, pillow shams or whatever unique technique she would like to discover in an in-depth manner. Her process of learning is to do it and document, then share it. She has essentially created a whole library of what has peaked her interest, learned in-depth and documented to share with the rest of the world. This has been a longer road to arrive at fabric designer than one might think, since she started quilting at just 19 (she learned to sew at 6). She calls herself one of the few kids that spent their college years quilting. 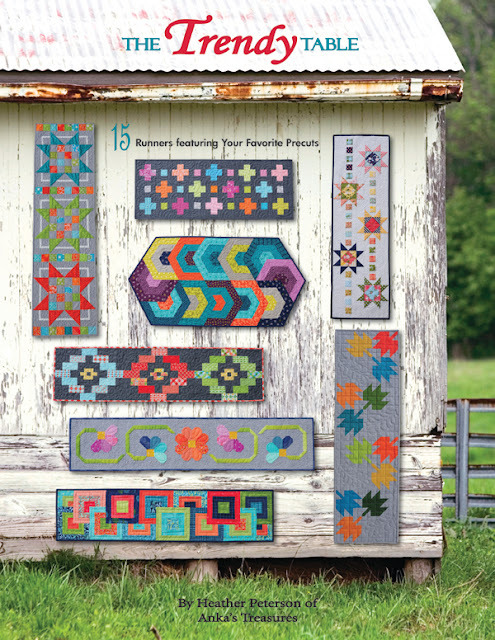 Within a year of beginning to quilt, she started designing her own patterns. Her foray into entrepreneurship started soon after that. Anka’sTreasures was born. In the beginning, she did pattern design as well as quilting for other people to keep her business afloat. Eventually the pattern business grew and quilting for others receded. She went to quilt market with her patterns and books, and 4 or 5 markets after that is when Henry Glass found her and asked her to design fabric. With the idea of fabric design on the table, yet another interest of Heather’s was peaked. She had taken art classes in college, was always painting and doodling, but here was a new opportunity to challenge herself. So, she did. Her first collection was a brown work style, with very traditional colors and designs. Gradually her design style has shifted. When her sons came along she developed her first children’s novelty line called Here Fishy, Fishy. Her style has brightened up and prefers bold, trendy and bright palettes. Her latest collection, that was released in March and ships in November is called “Big Splash” and is a clever bold color selection of blue, green, yellow, orange and red with gray as the neutral. 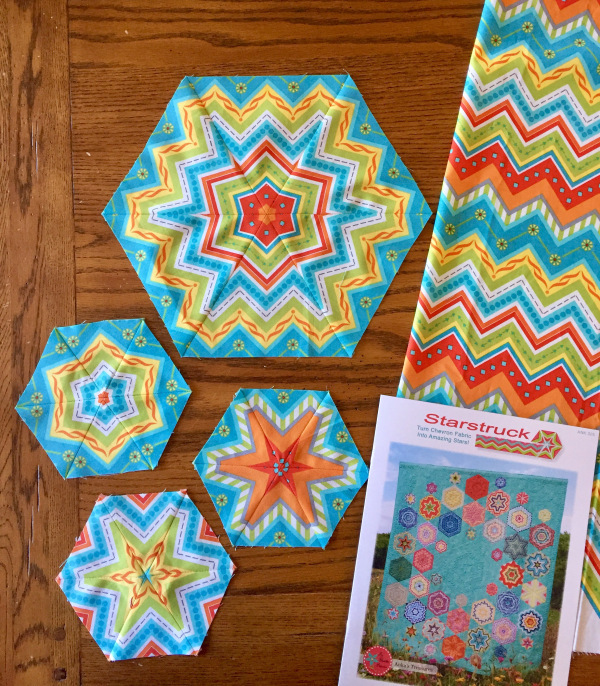 It features a signature chevron, which Heather likes to use for another of her sewing interests – Stars. Which are featured in her Starstuck booklet. Before our interview was over, a central question remained. Where did the name of her business, Anka’s Treasures come from? The woman named Anka was Heather’s Great Grandmother. Heather’s mother’s father was killed while their family was still young. Grandma Anka stepped in and helped raise Heather’s mother and taught her how to make patterns out of feed sacks to make clothing and decorative sewing for the home. This was the same environment that Heather grew up in, with the philosophy of creating something from an idea just takes pursuing it until you make it work. The concept that you can start with essentially nothing and give an idea life is part of Anka's legacy today in the company today. It's the idea of pursuing lots of hard work until you make the result you were looking for appear. Everything that Anka’s Treasures is, is a result of the tenacity of that belief. Today, Heather and hubby still live in the same area they grew up in. They met 17 years ago at church and eloped to San Francisco. Life for the Peterson’s is both never changing from their firm roots of faith and family and ever-changing by what Heather takes an interest in creating. Comment below to say give a warm hello to our fabric designer, Heather Mulder Peterson. 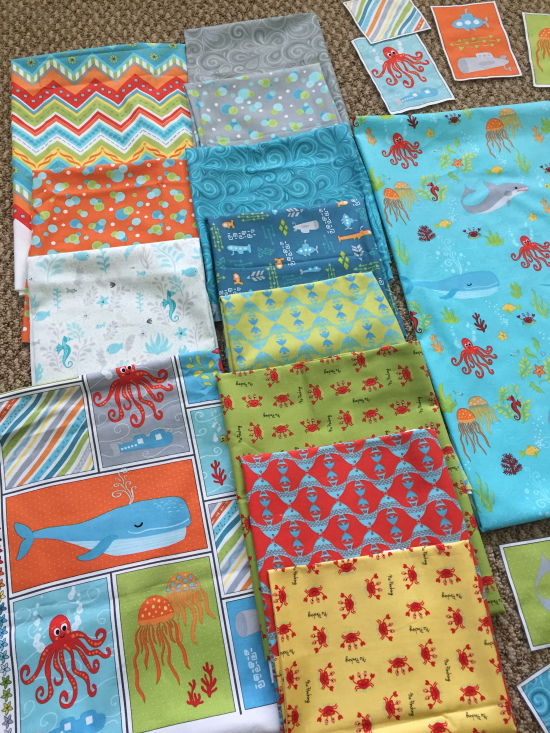 Heather's blog was one of the first I found when I started quilting 7 years ago! Her designs have great visual interest, and her patterns are so well written and easy to follow. She remains one of my favorite pattern and fabric designers. Her blog is a great mix of business and family. Who can resist photos of those happy little boys? What a lovely story. This is the first I've heard of Heather and her designs--I love them! I'll be sure to keep my eyes and ears peeled for more from her. Peace & joy to all. I was a high school quilter, too, but took a break from sewing for almost 30 years (while raising children in a 2-bedroom home with no room to sew). 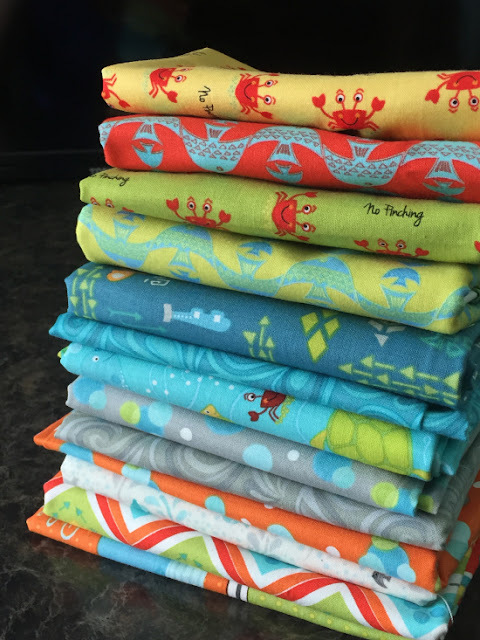 Now with an "empty nest", I have a room to sew and have started to quilt again ~ never heard of Heather previously, but I like the chevron prints with stars as well as her 'sharkie' fabric, so I will be investigating her books and watching for future designs! Wow really cool! She sure has written a lot of books. Pretty fabrics!! Hi Heather, Thank you so much for sharing your talents. I really like what I see. I hope to see you at one of the quilt shows. So happy to see this article about Heather. She is so talented. I have many of her patterns and have almost worn on the book "On the Run Again". I can't wait to start making runners from The Trendy Table--lots of fabric, not enough time!! In a few years, I hope you'll be able to travel to Minot, ND to teach! Keep up the great work! I LOVE bright fabrics, too! Fun, playful fabrics, your story is very inspiring! I have several of Heather's books and have made several projects. I love her use of color. Heather's family is beautiful!! I have several of her books and have made a few projects, she is so talented!! Love her use of colours too! Our guild had Heather do a presentation-she is wonderful! I love her patterns and have several. I am working on my fourth "Oh Baby!" quilt from your book Little Quilts 4 Little Kids. Kids just love seeing their name on their quilt! Heather and all her beautiful quilts and books have been a great inspiration to me. Been following Heather on her blog since before the boys came along! Patterns are so well written and I am looking forward to this new book! I love to sit and stitch and end with a beautiful project. I started following your blog. I would love to sew some of these patterns. The fabric is so cute, too. Plus, those "stars" made from chevrons is very eye-catching! Congratulations on book #30! I love your designs! I am expecting my 11th grandbaby, the 1st for my son who is a fire fighter and I'm having trouble finding fabric. Any chance you might design a line around fire trucks? I love everything you do! Keep up the great work! I was one of the first people that Heather longarm quilted for. I've watched (and sometimes photographed) from her first book to her 30th. She's an amazing designer, great mom, and a fun, inspiring person to be around. Many years ago Heather came as the guest speaker and teacher at the annual quilt show for our quilting guild. Not only were the lecture and classes great, but Heather is such a sweet person. She's the type of person you'd love living next door even in she weren't a quilt and fabric designer. Best to you, Heather, and much success. I've been a fan of Heather's design for several years, follow her blog posts and own several of her books. Her patterns, books and fabrics are all fabulous. Plus, she is an exceptional knitter! Thanks to everyone who stopped by this blog and left such nice comments for me! I enjoyed reading them and appreciate all the kind words. Quilters are the best people! Great article, Heather. I first saw one of your quilts at Clara Mae's house and I'm glad to be following you. Congratulations for your success! Love supporting a MN designer. Looking forward to the new book and fabric. I will be on the lookout for both. Ready to do your Christmas shopping in May?